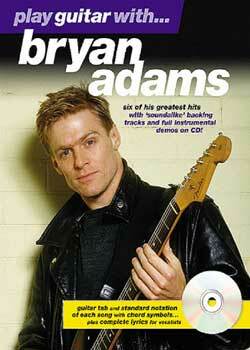 Play Guitar With Bryan Adams PDF + Mp3 CD download. Play guitar with the rock star on 6 of his greatest songs, including 18 Til I Die and The Only Thing That Looks Good On Me Is You. Includes full guitar transcriptions (in tab and standard notation), chords and full lyrics. Accompanying CD contains two specially recorded backing tracks for each song, one with guitar and one without guitar. Bryan Guy Adams is a Canadian singer, guitarist, songwriter, photographer, and activist. One of the world’s best-selling artists of all time, Adams has sold 100 million records and singles worldwide. Adams rose to fame in North America with his 1983 album Cuts Like a Knife and turned into a global star with his 1984 album Reckless which produced some of his best known songs including “Run to You” and “Summer of ’69”. In 1991, he released “(Everything I Do) I Do It for You”, one of the best-selling singles of all time. Adams also spawned the U.S. Billboard Hot 100 number-one singles “Heaven”, “All for Love” and “Have You Ever Really Loved a Woman?”. Download Play Guitar With Bryan Adams PDF free and other books from our site. Only high quality PDF scans. Please write a review, it's important for our community.